The Greenhouse Backpacker Melbourne is centrally located in historic Flinders Lane, a heritage precinct in the heart of the cosmopolitan Melbourne city centre. Travellers and backpackers will be one block from the Town Hall in a bohemian atmosphere, with outdoor restaurants, public transport, great ambience and an abundance of interesting shops and arcades located nearby. 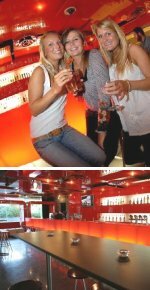 Great value Melbourne hostel accommodation with fantastic facilities and lots of Free inclusions. After great value and a central location, then stay at the Space Hotel (formerly known as Victoria Hall). Space Hotel is a modern city budget accommodation hostel, which is located in the Melbourne CBD - just 3 minutes from Melbourne Central Station, shopping areas including QV and easy access to tranport. Specifically designed as a city hostel, we offer your choice of spacious twin, queen and dorm rooms all with shared bathrooms. Space Hotel is your home away from home. Space Hotel Provides you with much more than just a bed to sleep, an address to collect your mail and Gym, Theatre room, Games room with arcade machines, 24hr gourmet fresh roast coffee machine, 24hr Snack and drink vending machines, Kitchen facilities, Complimentary Tea & Coffee, Travel & Transport, Free City Tram tour, Discounted tour booking service, Life & Living, Unisex showers and toilets, Free Mail Holding Service, Internet Access only $3 per hour, Free Notice Board - Always have jobs available, Coin operated laundry and Free Luggage Storage. Business Facilities Faxing and photocopying are available at Reception. Known as one of the world's most livable cities, Melbourne is a great place to visit - a vibrant nightlife and Australia's cultural capital. The fantastic location of Space Hotel Accommodation puts you in the middle of Melbourne's diverse attractions. Within minutes of Melbourne's restaurants, cafes, nightlife, city baths, gyms and shopping, your stay at Victoria Hall will surely be an eventful one! So why not check out Melbourne Central, Queen Victoria Market, Carlton Gardens, Lygon St (European Food St), Melbourne Museum, IMAX and the Old Melbourne Goal. All of this and much more are located within walking distance of Victoria Hall! Recently rated in Top 10 Hippest hostel WORLDwide by Lonely Planet and Most LUXURIOUS hostel worldwide byTravel Magazine.net !!! Base Backpackers Melbourne hostel is situated in Melbourne's, if not Australia's, coolest area - St Kilda and offers a unique style of hostel accomodation, combining state of the art facilities with a laid back vibe. The hostel is located only a short tram ride from Melbourne city centre, and in the heart of St Kildas' cafes, restaurants, bars and boutiques. The famous Acland and Fitzroy St are only a minute's walk away. Come and experience our great facilities and hang out with our friendly local staff. Inside the Base St Kilda, you will find all the cool stuff including a 24 hour reception, fantastic bar, multi media equipped internet stations, Travel Agent, games room, TV room, smokers courtyard, wireless internet and breakfast buffet available. Come join us in the Red Eye Bar to kick off your stay in St Kilda with a free drink on check in. Ladies, every Thursday night its your night, for St Kilda's biggest backpacker's party. Our local DJ's will keep you dancing all night long. Great drink specials and competitions every night of the week, with happy hour everyday from 5-8pm. All accomodation has ensuite bathrooms, security lockers, heating/airconditioning and fresh linen is provided. The Base also features the innovative and luxury Sanctuary floor - for girls only - feel safe and pampered. Base St Kilda is committed to being the cleanest hostel in Melbourne. The housekeeping team are permanent and professional staff who care about what they do. All dorms and ensuite bathrooms are cleaned daily and beds made with fresh linen. Only 4 years young, the Base St Kilda is a multi award winning, modern, purpose built property in the heart of cosmopolitan St Kilda. Base is both stylish and hip, located 1 minute from Acland St and its multitude of cafes and bars, and with the beach is just a 5 minute stroll away. Base Hostel Melbourne is the place to be. Budget accommodation in the heart of South Yarra. Hotel Claremont provides hotel accommodation for the traveller watching their wallet. Located along Toorak Rd in South Yarra, this hotel has restaurants, cafes, boutique shops, bars, nightclubs, trams and a train station all at its doorstep. Catch a movie at the Jam Factory, stroll to the Melbourne Royal Botanical Gardens, take a stroll along the Yarra River or head into Melbourne CBD. Breakfast room and Guest Lounge available for guest use. Internet cafe and WiFi. Guest laundry with coin operated washers & dryers. Providing budget accommodation at economical prices, enjoy the hospitality and friendly atmosphere of St Arnaud Guest House in South Yarra, only 3 kilometres from Melbourne CBD. Offering a range of accommodation, including budget twin rooms, family rooms, mixed dormitory rooms and single rooms, this Melbourne guest house can cater for single travellers, couples, groups and families desiring affordable and comfortable accommodation with easy access to Melbourne public transport. The longer you stay, the cheaper the rate! We have bicycle hire, fast internet computers, BBQ area, fully equipped guest kitchen and laundy area. Wireless internet throughout the building..
Fantastically located close to the Rod Laver Arena, Olympic Park, Aquatic Centre and all other venues. All of these attractions are very close by: Melbourne Cricket Ground (MCG), National Gallery of Victoria, Federation Square, Royal Botanical Gardens, Crown Casino, Albert Park - home to Melbourne Grand Prix, Rod Laver Tennis Arena - home to the Australian Open and the Flemmington Racecourse - home to the Melbourne Cup. Getting here is easy by train or on Melbourne's famous trams - the No.8 tram stops outside our door! Budget conscious backpackers will love All Nations Hostel because of all the extras you get when you stay - Free breakfast daily , Free beer on arrival, Free bicycles & Free linen. Situated in one of Melbourne's best CBD locations, right next to Southern Cross Station, the Yarra River and Southbank, the hostel is housed in an old renovated building with heigh ceilings and large communal areas. Whether you are traveling with friends or alone you will never be short of things to do or people to meet, because at this hostel we LOVE ALL NATIONS, the way the world should be! Accommodation offered ranges from 4 to 10 bed backpacker dorms, female only dorms, and double or triple private rooms all accommodation includes 24 hour hot showers, no curfew, FREE linen and duvets and FREE breakfast every morning. All Nations is a backpacker hostel as it should be: inclusive, communal, with a living, breathing party atmosphere, and run by characters who are probably crazier than you are! Situated in one of Melbourne's best CBD locations, just down the road from Southern Cross Station and right beside the Yarra River and Southbank, we offer clean, basic and affordable accommodation in a delightful old renovated building with high ceilings and large communal areas. We've got everything covered... Relax in your room, have fun in the bar taking part in the activities, pop down the road to the casino or speak to the knowledgable staff about all of your travel options. It's easy to enjoy Melbourne when you stay at All Nations Backpackers. Our UNFKNBLVBLE Bar is the perfect place to enjoy a cold beer, hang out and meet loads of people. We are open til late every night and have nightly activities including Mexican Madness Mondays, Killer Pool comp on Tue, the funniest/weirdest trivia night in town on Wed, Open Mic Night on Thursday, Ladies Night on Friday, and on Saturday we just party like it ain't no thang. Situated 300 m from Crown casino, 200m from the Yarra river and southbank and on the other side just 300m from Southern Cross Station and a short walk to the Telstra dome. We also have the free city circle tram at our door! St Kilda Beach House is the newest and the funkiest backpacker hostel accommodation in the heart of one of Melbourne's most fashionable and coolest inner city locations - St.Kilda. This backpacker hostel accommodation is just a 5 minute walk to St Kilda's famous beach, and Prahran's Chapel Street, Melbourne's fashion precinct. Lots of cafes, cool funky atmosphere, bohemian surroundings and loads more are right at your door step. The St Kilda Beach House is the home away from home for backpackers visiting Melbourne, budget travellers watching their money, cheap group accommodation, couples wanting a cool spot to stay with all the style and pizzazz of the big hotels or even the astute business person who wants brand new inner city accommodation at great prices very affordable! The funky new spacious accommodation gives you all the comfort you need when travelling. All rooms have private ensuite bathrooms and are air conditioned with swipe card access. The rooms are cleaned daily and all linen is supplied and have balconies, most with cool bay views, so you can truly soak up a St Kilda experience. FREE Breakfast. FREE Luggage Storage. FREE Pool. FREE Lockers. FREE Linen. FREE Discount wrist Band. FREE Live music. FREE EPL on big sreen. FREE Foxsport. FREE Entertainment. Free T Shirt . Facilities include a fantastic tour desk, the new bar - Pretty Dulcie, communal kitchen, dining area, 24 hour security, swipe card access, internet access, guest kitchen, cable TV, a common room, pool table, all linen is included, security lockers, towels hire, hairdryer for hire, cafe, restaurant, air conditioning, iron/ironing board, luggage storage, lift/elevator and 24 hour reception. Luggage storage, Internet Access, Web Access in Lobby, WiFi in Lobby, Guest Kitchen, Cable TV, Common Room, Pool Table, Linen Included, Security Lockers, Key Card Access, 24 Hour, Security, Towels Hire, Hairdryer for Hire, Bar, Cafe, Breakfast, Continental Restaurant, Air Conditioning, Iron/Ironing Board, Tours Desk, Luggage Storage, Elevator, 24 Hour Reception. FREE Breakfast, FREE Luggage Storage, FREE Pool, FREE Lockers, FREE Linen, FREE Discount wrist Band, FREE Live music, FREE EPL on big sreen, FREE Foxsport, FREE Entertainment Free T Shirt. Nomads Melbourne offers the best budget accommodation in Melbourne with cheap backpackers beds and value for money hotel style private rooms. Nomads Melbourne Backpackers Hostel sets a new standard for hostel, backpacking and budget accommodation. Nomads Melbourne Backpackers Hostel accommodation is Melbourne's first purpose built flashpackers, offering travellers a unique backpacking experience, redefining backpacker hostel accommodation. The hostel is located in the centre of the Melbourne CBD, backing onto the Queen Victoria Markets, close to all Melbourne city attractions, City Circle Tram, Tourist Shuttle Bus, beautiful gardens and fantastic shopping. Enjoy budget accommodation in style. At Nomads Melbourne Backpackers Hostel you can indulge in the luxury of a deluxe en-suited King/Twin room, relax in style in a multi-share private room, or meet your fellow travelers in a 4-10 share dormitory room. All rooms feature fresh clean white linen and duvets, electric fans, operable windows and heating. And for the ladies, Nomads Melbourne offers the exclusive, women only Princess Wing. Dorm rooms are great for the budget conscious traveller and include linen and lockers, while the private rooms further offer private ensuite bathroom and Flat screen TV with FREE Foxtel TV. Your backpacking experience comes complete with state of the art cinema lounge, wireless internet, communal kitchen, BBQ facilities, two guest laundries, roof top sun deck and elevator access to all 5 floors. Further guest facilities and services include travel & job desk, 24 hour reception, wheelchair accessibility, secure luggage storage, free city tour, no curfew, 24 hour hot showers, daily housekeeping, ATM banking and towel hire. Nomads Melbourne offers the backpacker/traveller everything they need from their Melbourne accommodation experience. The Industry Bar & Lounge is a stylish & funky place to hang out, a crazy place to party and offers all guests a FREE nightly drink. With comfortable leather lounges, video juke box, fox sport showing premier league football, pool table, wireless internet, and rear sun deck there is always good times to be had. The hostel is located in the centre of Melbourne, backing onto the Queen Victoria Markets - Australia's largest outdoor market. With its city central Melbourne location, Nomads Melbourne Backpackers Hostel is one street away from the free city circle tram and walking distance to all major attractions and events. Melbourne is the home of Australia's major events such as the Australian Open Tennis, The Australian Formula One Grand Prix, The Melbourne International Film Festival, The Melbourne Comedy Festival and the Melbourne Cup Racing Carnival. Famous for its great shopping precincts, funky café's and efficient public transport system, Melbourne is continuously voted in the top ten of the world's most livable cities. Melbourne is a perfect base for day trips to the Great Ocean Road, Phillip Island Penguin Colony, the Grampians and some of Australia's great wine regions. Stay at Melbourne's newest backpacker hostel in Southbank, Melbourne. Choose from a selection of shared dorm rooms, double ensuite rooms and family ensuite rooms. All rates include towels, luggage storage and a free breakfast. Walk to Crown Casino and South Melbourne market, public transport is located close by and Melbourne city centre is an easy 10 minute walk away. Our bar is complete with plasma TV screen & big screen projector. Pool tables available Guest laundry facilities Internet computers available Book exchange and reading area, Board games area and chill out zone. Melbourne is a city with something for everyone, that oozes with culture and fun. From chic fashion stores to buzzing laneway cafes and funky bars. To sports stadiums, botanical gardens, film and food festivals to galleries and the best live music and dancing venues, Hotel Discovery is located right in the heart of it all. Melbourne is the host of the famous Formula 1 Grand Prix every year and is home of AFL footy and The Melbourne Cup. Melbourne is a city where people see, breathe and live the arts. It hosts some of the premier cultural calendars in the nation, including the International Arts Festival, International Film Festival and the International Comedy Festival. The city also plays host to a diverse collection of galleries. Wander down Flinders Lane and pop into one of the many independent galleries or take time out to explore the plethora of public art. Hotel Discovery is a stone's throw from the Queen Victoria Market, a 10-minute walk to funky Brunswick St and is surrounded by Melbourne's best venues and attractions.